Georgetown- Ethel Mae Loveitt, 85, of Loveitt Lane died Friday, December 21, 2018 at her residence. She was born in Town Hill, Bar Harbor on June 19, 1933, to parents Byron Lorenzo and Ida Estelle (Robbins) Richardson. She moved to Bath in 1941 and graduated from Morse High School in the Class of 1951. She married Wilbur Ferris Loveitt on June 19, 1952. They owned and operated The Arcade and Park Bowling Alley in Bath with her brother-in-law, George Loveitt. She also worked at W.T. Grant in Bath, the Mammoth Mart office in Brunswick, Redlon’s in Bath, and was the Arrowsic Town Treasurer for 8 years. She was a member of Bath Rainbow Assembly #6 for 60 years, serving as Mother Advisor and on the Advisory Board. She was a life member of the Genesta Chapter Order of the Eastern Star #73, and a member of Auburn Association of Social Order of Beauceant where she was a Past President and Supreme Registration Chairman. Ethel was a Past President and Supreme Deputy of Emblem Club #273 in Bath and #323 in Brunswick, a member of the West Bath Grange and was treasurer of the Arrowsic Fire Dept Ladies Auxiliary. While raising her daughters, she was a Girl Scout leader and director of the Girl Scouts Camp at Sewalls Woods in Bath and Camp Montsweag, and president of the Fisher Mitchell School P.T.A. 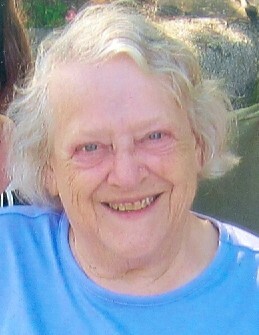 She was a member of the Bath United Methodist Church. Ethel enjoyed reading, knitting, camping at The Forks, traveling with her family, and boating. She was predeceased by her husband of 55 years, Wilbur, on June 3, 2007; a son, William, in 1955, and sisters Barbara McCann and M. Louise Wells. She will be greatly missed by two daughters: Debra Wardle, and Sharon Guethle and her husband Jeffery; four grandchildren: Erica Wardle and her husband Marc Vallen, Kirsten Alicea and her husband Antonio, Sarah Howard and her husband Chris, and Michael Guethle; four great grandchildren: Antonio and William Alicea, and Tessa and Olivia Vallen, many nieces and nephews, and by her faithful cat, Mittens. A visiting hour will be held at 11 A.M. Saturday, December 29, 2018 with an Eastern Star Service at 11:45 at the Bath United Methodist Church, Oak Grove Ave, Bath followed by a funeral service at 12 P.M. A gathering of family and friends will follow at the church. Burial at Mountainside Cemetery in Georgetown will be private. In lieu of flowers, memorial contributions may be made to Scottish Rite Learning Center, 1903 Congress Street, Portland, 04102.